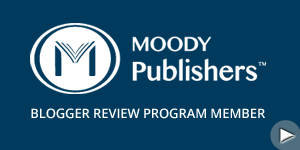 I requested an evaluation copy of the Thomas Nelson King James Study Bible through their BookLook Bloggers Program (HarperCollins Publishers) so I could review it. Overall, it’s a very nice Study Bible. If you are looking for a good quality KJV Study Bible, then this one should be near the top of the list for sure. Excellent font size makes for easy reading and very well designed layout make it easy to navigate the features and use them effectively. 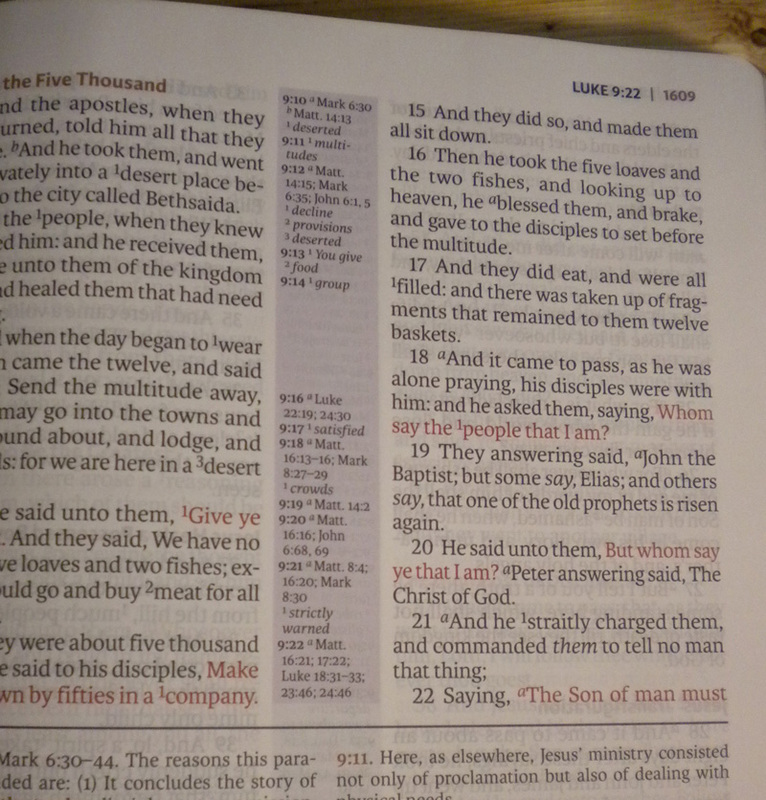 Overall, the King James Study Bible from Thomas Nelson is a really nice Study Bible. The print is nice and large and easy to see at about a 9 point font for the Scripture text and a 7 point font for the study notes. I do like the level of detail that the study notes go into, which unlike some of the other Study Bibles I have reviewed, these do go into a nice depth level. Not too little, yet not too much commentary either. Good balance in my opinion. The print is in full color and has a very pleasing design and layout to it. A lot of high quality photos and images and good articles. 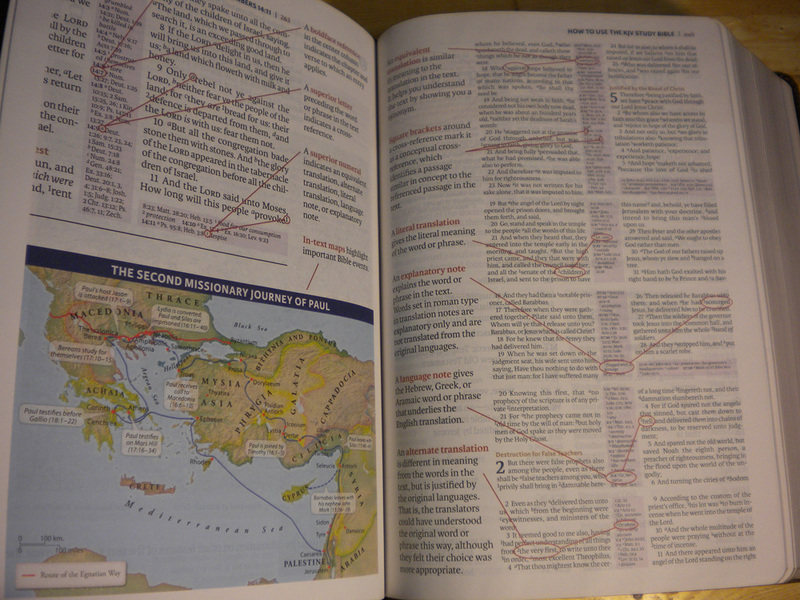 Actually, this Study Bible has one of the best “how to use this Study Bible” sections that I have seen. It is very detailed and helpful. If you get this Bible, make sure you check that out so you know how to use it to its fullest extent. Overall, I would say that if you are in the market for a King James Study Bible, then this is one that should be at the top of your list to check out for sure! You can select whichever binding type you prefer from good quality genuine leather all the way to hardcover. Highly recommended Study Bible. I received a copy of this Study Bible in exchange for this review from Thomas Nelson and all opinions are my own. Price: At the time of writing this review, the cheapest place to get this Bible from is Christianbook.com. They have it for $42.99 – suggested retail from the publisher is $64.99. Please note that these prices do not include any potential shipping charges. 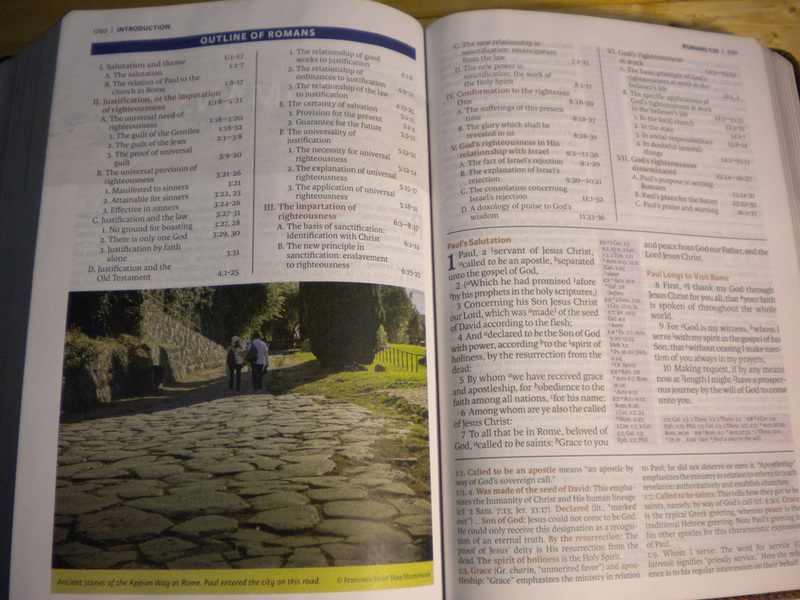 This Study Bible does fairly well at laying flat for studying. It’s not the best one that I have encountered, but it is not the worst either. 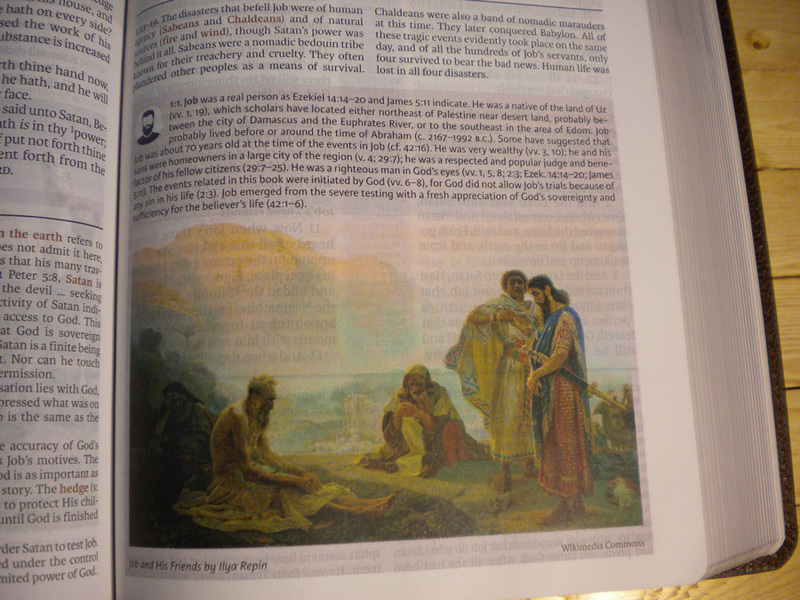 Here is a picture showing it laying open to the first page in Genesis (book introduction page). Once you are toward the end of Genesis, it lays down flat very nicely. I have a feeling that with repeated use, it will lay more flat once broken in a little more. Typical list of the books in canonical order, the abbreviation used and the starting page to turn to for each book. One of the best how-to articles I have seen in a Study Bible. 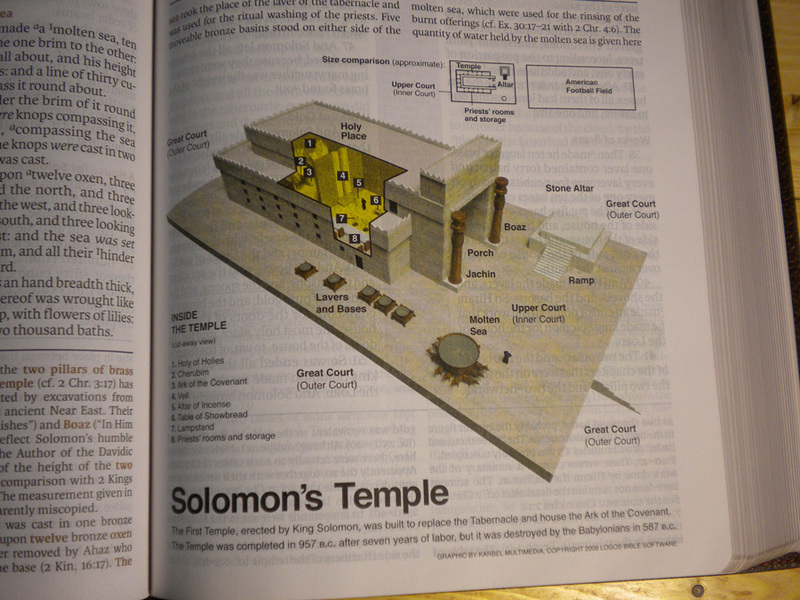 It helps the reader understand every feature and tool that is included in the Study Bible. Very recommended to read if you purchase this Bible as it will help you more effectively know how to use the different features in this Study Bible. 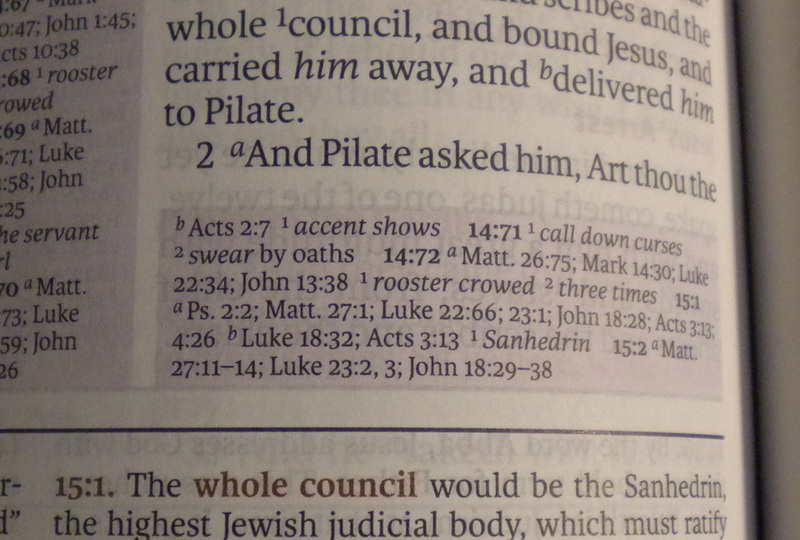 This section gives an index as well as an explanation of one of the nice features of this Study Bible. The Doctrinal Footnotes (see example later in this review) give Scripture reference and commentary on major doctrinal beliefs. 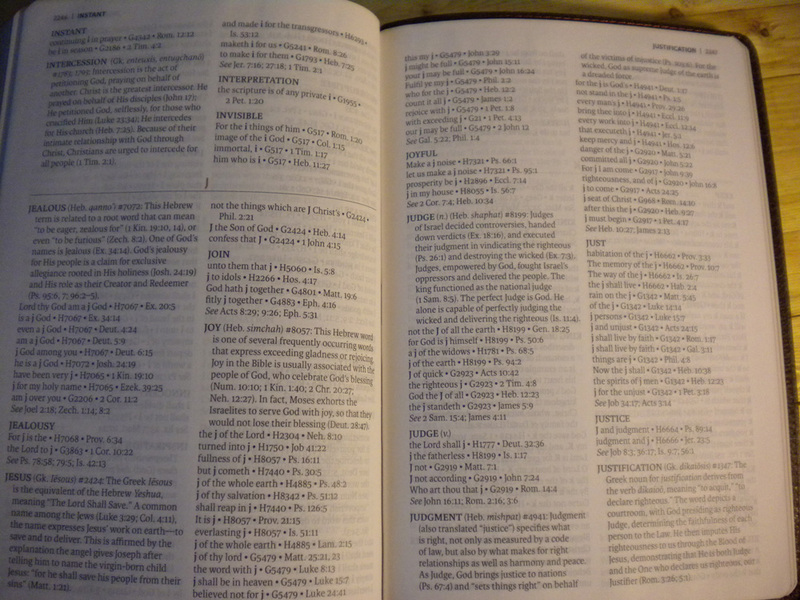 The index is divided into major subjects and then sub subjects and where you can locate them in the Scripture pages. A nice harmony of the Gospels listing out roughly the where and when an event happened and then where in the Gospels they are mentioned. It also provides non-Gospel related references to each event. A brief section of a few paragraphs that highlights the book at a high level. There are many Doctrinal Footnotes throughout this Study Bible. These are very short articles that briefly cover a doctrinal point giving description of the doctrinal topic, then an illustration of that topic concluding with how we can apply this doctrinal topic to our lives. I like these types of features that some of the Study Bibles are using these days. 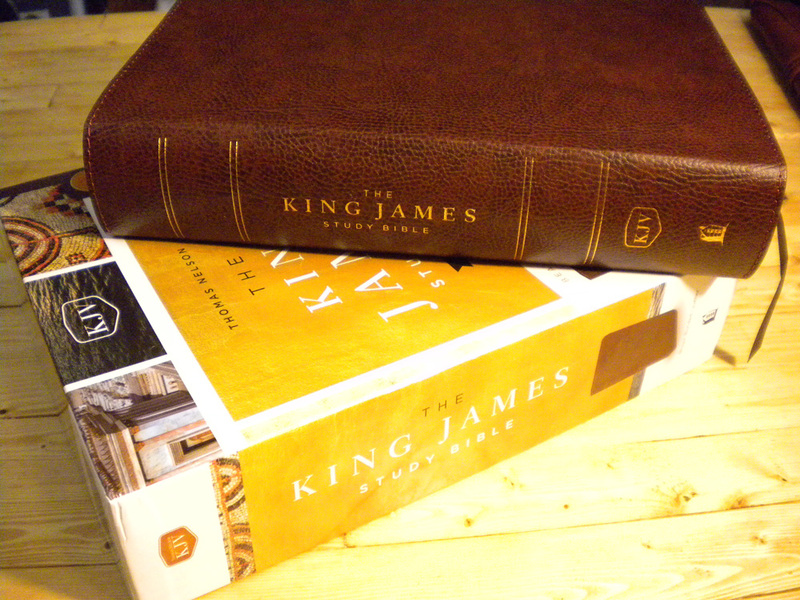 The King James Study Bible is no exception to this. This feature provides very good information regarding different people who are mentioned in Scripture giving background on them and any pertinent information. There are many brief articles and photos that pertain to different archaeological sites that are mentioned throughout the Bible. 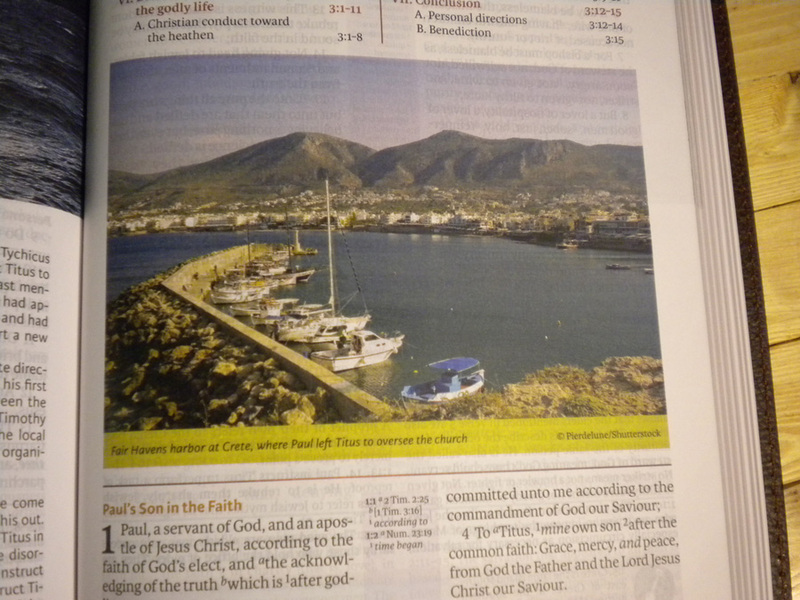 The full color photos and images are very nice in this Study Bible. The in-text maps that are full-color are very nice and easy to read. They are placed throughout the pages in the location that applies to them. 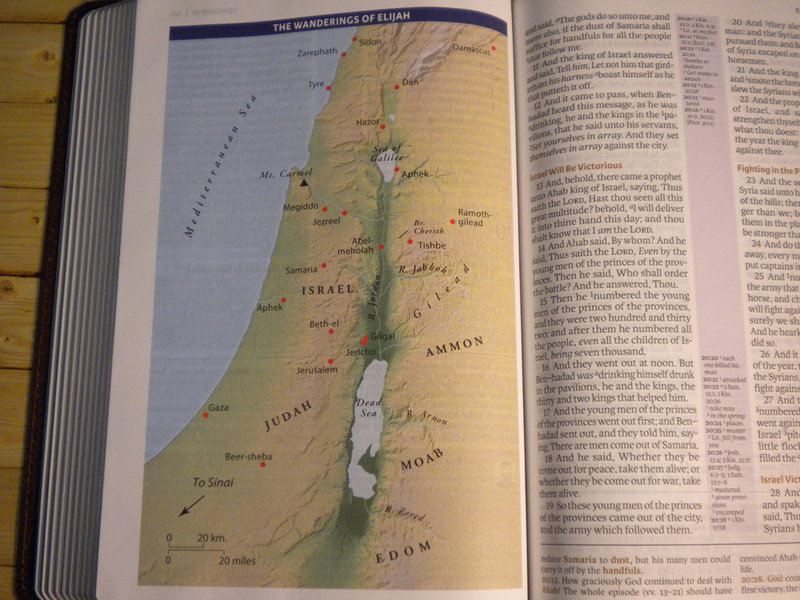 For example, The Wanderings of Elijah map is located in the area of Scripture that pertains to Elijah. Center-column cross references are nothing new to anyone that has seen a majority of the Bibles on the market today These are fairly easy to read despite the smaller font. I think partially because of the light purple background on which the cross references are placed. 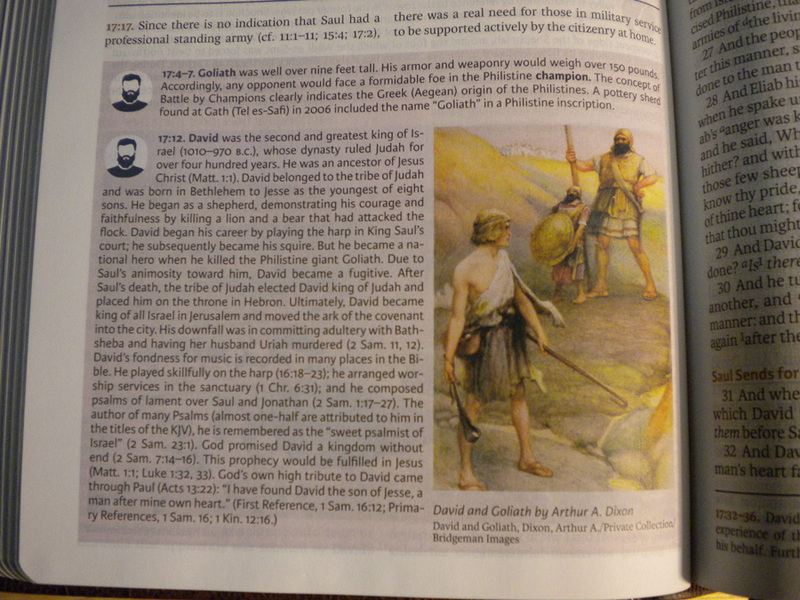 While this is not the most study notes I have seen in a Study Bible, it provides a very nice level of details and commentary to make this a viable option if you are in the market for a good Study Bible. The Words of Christ are done in a very nice red font and easy to read. Typical footnotes from the translators for the New King James Version. I have said in many previous reviews that you should always pay attention to the footnotes from the translators. These can really help you understand better about Scripture by knowing what the translators were basing their translating decisions on. 14 pages of a tool that allows you to quickly locate via key words different things regarding Jesus in the Gospels. 5 pages of the different teachings of Christ in alphabetical order. 8 pages of points where Jesus fulfilled prophecies about the Messiah from the Old Testament. This is presented in the order of how they were fulfilled. It includes what the Old Testament prophecy is, what the subject of the prophecy is and then the scripture from the New Testament where Jesus fulfilled it. 12 pages of an index by topics that gives readers a quick way to look at a specific topic that Paul covered in his letters and where to find it in the New Testament. 3 pages of the typical charts of money, weights and measurements. The nice thing that these charts do is to give current day equivalents (handy especially with the monies chart). 1 page that provides an overview of the Jewish calendar months and certain aspects of time such as “watches” like “third watch” at night is from midnight to 3 am. 2 pages that list out by Subject and Scripture reference of the different prayers that are spelled out in the Old and New Testaments. 19 pages of an index that covers in alphabetical order all of the different doctrinal notes, personality profiles, archaeological sites and other annotations used in this Study Bible. 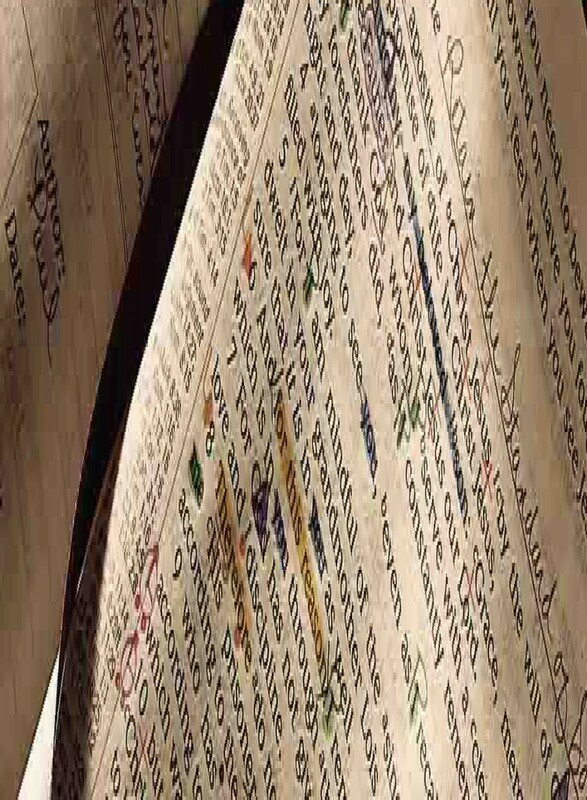 167 page Concordance that also features a listing of the Strong’s number for each entry which used in conjunction with any other dictionary tool can help to provide a better understanding of the Scriptures. A portion of the entries have a word study to give a better understanding of the specific word. Not exhaustive by any means, but a nice thing to add for your studies. These are the typical maps you find at the end of most Bibles. Nice graphics and easy to read compared to other maps I have seen. This section is where I get to tell you about how I like or dislike this Bible in a detailed manner. What I typically try to do is do a quick glance over the entire book at a high level to get a feel for it. Then I will go in-depth in a shorter book such as Philippians so I am comparing the same thing from Bible to Bible. Hopefully, doing this gives my reviews a certain consistency to them. I would say that this Study Bible is easy to use. I’m not going to go into the readability of this translation vs. that translation. For this review, I am looking at the study tools that it provides and not at the specific translation (KJV in this case). To any Bible reader/student, the tools and layout/design of this Bible are done in a very easy to use and pleasing manner. The extra-biblical reference materials and commentary do have a natural flow to them. The Annotations – I did not read every single one of these articles by any means, but the ones I did read were solid and very helpful. 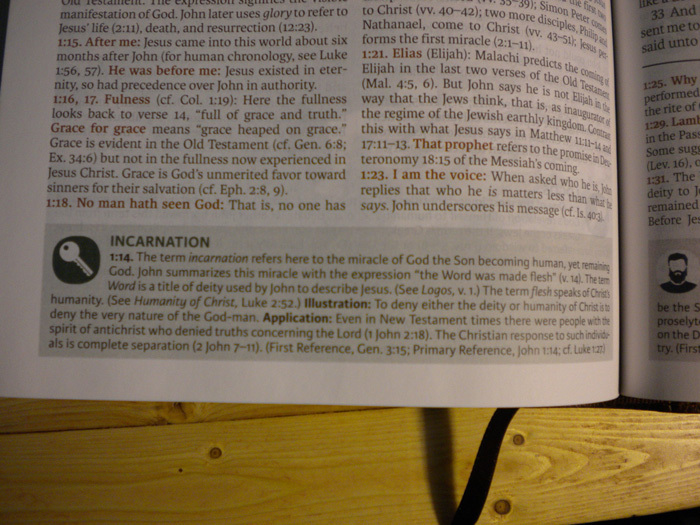 The Index to Annotations toward the end of this Study Bible provides the tool to look up specific articles as needed. There are a lot of them for sure ranging from doctrinal keys, personality profiles to archaeological sites and many other study notes. Very helpful and well done. 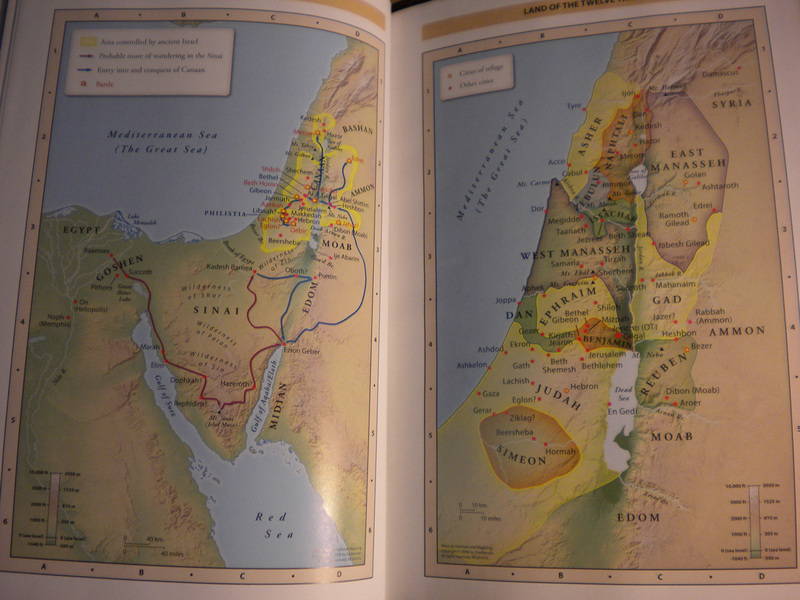 Maps – These are done very nicely in color and appear to be the typical ones that I have seen in other Thomas Nelson Study Bibles. The design, layout and printed type on the maps are done very nicely. Book Introductions – These book introductions are fairly typical to other Study Bibles that I have seen. They are typically two or three pages long. Not to short, but not a dissertation either. Very well done. From the quick glance through hitting multiple random commentary features, it does seem to be pretty solid. The copy I received is a bonded leather Bible, but for the most part, it seems to be fairly durable. Keep in mind that bonded leather is considered by many to be the low-end of real leather when it comes to quality and durability. I have a personal preference toward higher quality leather in leather-bound books, but even so, this Bible is Smyth Sewn (or section sewn), which means it will hold up better than some strictly “perfect bound” or glue back Bibles (similar to general paperback books) in my experience and opinion. According to the Thomas Nelson website, their Bibles do have a lifetime guarantee. This is shown on the back of the box the King James Study Bible comes in as well. They do have some information about their guarantee on their website and used to have you “register” your Bible to activate it. That information on their website (at the time of writing this) is outdated as you no longer have to register your Bible which I received confirmation from the publisher on this. Basically, if you have issues with your Bible, just contact the publisher, but you should keep your receipt in case you need it. Scriptures appear to be about 9 point font, which tends to be fairly standard size and font used in many Bibles. The study notes are smaller in point size (possibly 7.5), but it is done in a very clean and easy to read font. Scripture text and the commentary text are very clearly separated by a thick horizontal black line. If you are a note-taker, there is not very much room to write in the margins of this particular Study Bible – outside margins are about 1/2″. Show-through is where on thinner paper stocks, you can see a ghost of the print from the other side of the paper showing through. You will get a little bit of the distracting show-through that see in some Bibles, but it’s not as bad as what you see with other Bibles that use real cheap or thin paper. While you can see it, I personally didn’t find it overly distracting. It is more noticeable with the color images and background colors on the opposite page, but again, I wasn’t overly distracted by it. If you are highly sensitive to show-through, then you may notice it more than what I did. You can probably see it in a majority of the photos in this review if you look closely at the pics full size (just click them and they will open full size in a separate tab in your browser). I think you can see the show-through best on the “Translators’ Footnotes” picture in this review. The line-matching (printed lines on the front of the page vs. the back side of the page) aren’t lined up the best, but it isn’t the worst I’ve seen either. Publishers try to do line matching when they can because it helps with that previously mentioned show-through when printing on thinner paper stock. With all that said, I think line matching in a Study Bible is a very hard thing to do effectively due to all the study features incorporated in the design it will throw the lines “out of alignment” from the printed lines on the back side. 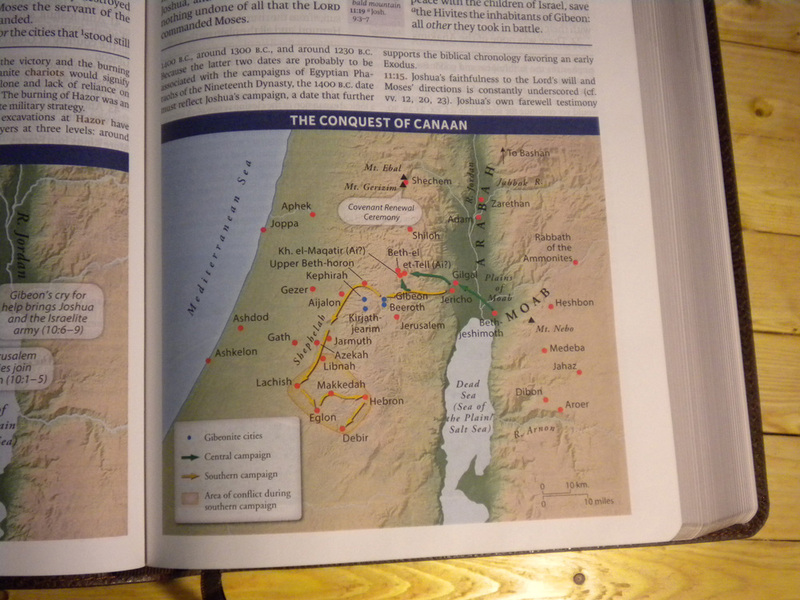 Full color maps in the back and normal print throughout this Study Bible are very good, although some of the maps in the back do have some slightly smaller print which may be harder to see for some people. 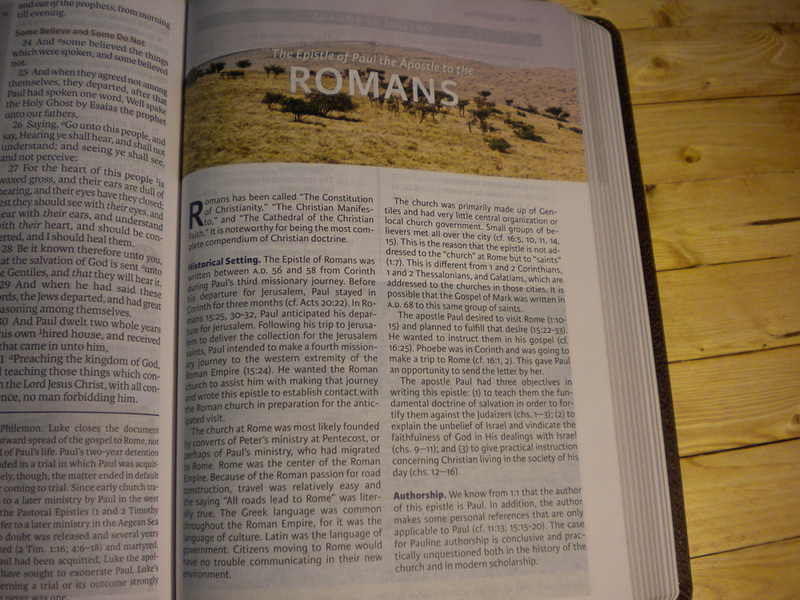 Reading and studying in Philippians and is pleasant with how the publisher designed this Study Bible. The book introduction and the study tools are all are done very nicely and laid out in an easy to follow design. The three page book introduction for Paul’s letter to the Philippians is very nicely done. It covers authorship of the book, where it likely was written, info about the city of Philippi, info on the Philippians themselves, dates of writing the book, the occasion for writing the book as well as the purpose of writing it. The Study Notes are clean and easy to follow without getting too wordy. The commentary in Philippians does seem to be pretty solid. Below, we have the overall ratings that I would give to this particular Bible with a 1 to 10 range. Keep in mind that when I am doing these ratings, it is based on the physical makeup, format, extra-Biblical content and value of the Bible, not rating the Word of God or a particular translation. Quality: 8.6 This is a leather-bound Bible, but the copy I received is bonded leather. 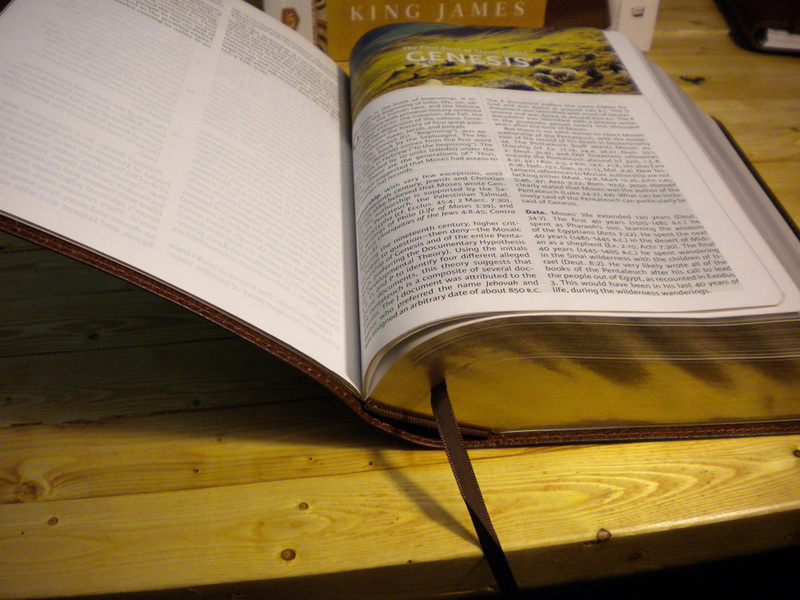 For a bonded leather Bible, the quality is fine. Yes it is Smyth sewn which helps the quality level from my perspective. My experience has been that bonded leather does not last quite as long as genuine leather, but then it also will depend on how well you take care of the Bible. Overall, this is a good quality Study Bible. Appearance: 9.5 The appearance of this Bible is clean. The design that the publisher came up with does make it very easy to follow the different types of Study Notes and tools. Value: 8.9 Considering the price you can get this Study Bible at, I feel that the value of this Bible is pretty good. Innovation: 8.4 Don’t forget to look at the back of the case this Study Bible comes in. 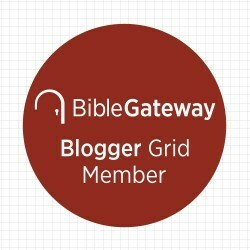 They have a website link to you a free sample digital download of a Vines “Complete” Expository Dictionary of Old and New Testament Words in a PDF format. I put the word Complete in quotes because this free download is just a sampler – not the whole book. I wish it was the complete version of the book, but still the 30-page sampler is enough to give you a taste that it would be a good study resource should you be in the market for something like it and want to just check it out. In 1798, Thomas Nelson founded his first publishing house in Edinburgh, Scotland, determined to make books, particularly Christian classics, affordable to the common man. In 1931, Pat and Bernie Zondervan began their publishing journey in Grand Rapids, Michigan, where they began buying and selling books and Bibles. HarperCollins Publishers acquired Zondervan Publishers in the 1980s and Thomas Nelson in 2012, integrating the two similar, yet uniquely different, publishing groups under one leadership. Today, the strength of these great names—Thomas Nelson and Zondervan—continue to represent the highest quality in Christian publishing, creating the Company’s foundation. This entry was posted in Apply the Word, Bible Reviews, Bible Study, Bonded Leather, Full Color, Gospel, Illustrated, KJV, Scriptures, Spiritual Life, Study Bible, Study Bible Reviews, Studying, Thomas Nelson, Word of God and tagged Bonded Leather, BookLook Bloggers, Full Color, King James Version, KJV, KJV Study Bible, Study Bible, The King James Study Bible, Thomas Nelson. Bookmark the permalink.